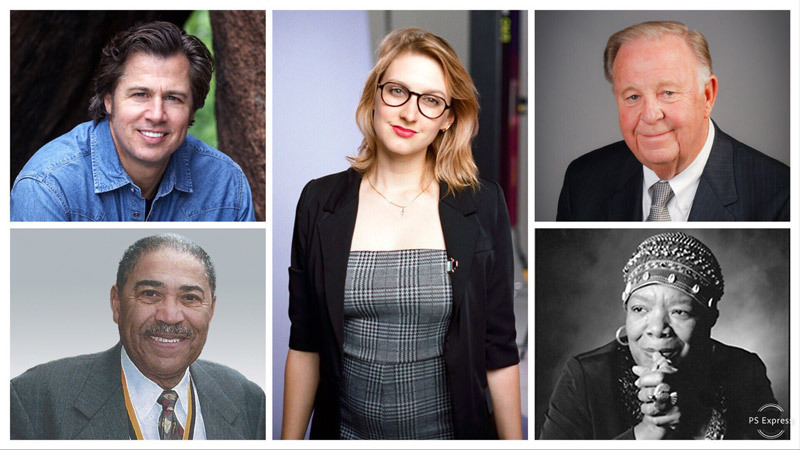 Maya Angelou, William Clay Sr., William Darr, Emily Geraghty and Doug Pitt will be inducted into the Missouri Public Affairs Hall of Fame April 12. The five inductees were selected as citizens with a connection to the state of Missouri who serve as examples of global citizens by defining the essence of public affairs, and who have acted consistently for the benefit of others. Up to six recipients are honored annually, with each induction class including up to one legacy award, which will be awarded to Angelou this year. The induction ceremony will be held at the White River Conference Center in Springfield. The black-tie optional dinner event will take place from 6-8:30 p.m. April 12. Tickets are $40 and tables are $750. Tickets can be purchased online. Maya Angelou was an author, poet, historian, songwriter, playwright, dancer, stage and screen producer, director, performer, singer and civil rights activist. Angelou worked for Dr. Martin Luther King Jr. and Malcolm X. She wrote and performed an original poem at the inauguration of President Bill Clinton. And President Barack Obama presented her with the Presidential Medal of Freedom. Angelou is best known for her autobiographies and poetry. Her poem, “Yet Just Give Me a Cool Drink of Water ‘fore I Diiie,” was nominated for a Pulitzer Prize in 1972. She died in 2014. William (Bill) Clay Sr. is a retired member of Congress. The first African-American representative from Missouri, he served in the U.S. House of Representatives from 1969-2001. His tenure was longer than any other former African-American member of the house. Clay started as a civil rights activist and labor union representative in St. Louis, and promoted bills that helped minorities and U.S. workers. William (Bill) H. Darr is a successful agribusiness entrepreneur. He founded American Dehydrated Foods, Inc. (ADF) in 1978. Today, his companies, along with ADF, also include International Dehydrated Foods, Inc., Food Ingredients Technology Company and IsoNova Technologies. Darr has been called a humanitarian, philanthropist, child advocate and higher education champion, among others. He and his wife, Virginia, have created many scholarships to help students pursue higher education. In 2002, they established the Darr Family Foundation. To date, it has awarded more than $2.7 million in grant funding to local organizations serving at-risk children. Emily Geraghty is an accomplished multimedia journalist and producer. During her years of developing video content and mini-documentaries, Geraghty has developed a unique creative voice producing videos that focus on identity issues for women and LGBTQ people. She created and directs the size-inclusive sensation, “Women Sizes 0 to 28 in the Same Outfit.” She was also awarded a Webby Award for her mini-documentary “Pretty Big Movement Destroys Dancer Stereotypes” from the International Academy of Digital Arts and Sciences. Doug Pitt is a businessman, investor and philanthropist. In 2007, he founded Care to Learn, a Springfield-based nonprofit that provides immediate funding to meet children’s emergent needs. Those health, hygiene and food items reduce barriers to help every student be successful in school. To date, the organization has met more than 900,000 of those needs for Missouri students, and serves more than 98,000 students from 33 school districts in Missouri. This year’s inductees will join more than 20 others who have had positive impacts on the state of Missouri. Visit the Missouri Public Affairs Hall of Fame website for more information.